Have I told you about my dream world? In said dream world, I have an enormous kitchen with tons of prep room, a huge island and lots of windows. I don't even care what the rest of the house looks like; it could be a shack, as long as it has a big ole kitchen. What will I do in this large kitchen? Well, I would spend each day cooking and creating fabulous meals for the dinner parties I would be hosting every night. I would have stacks and stacks of aprons so I could be fashionable in the kitchen, and would have a walk in closet filled with pretty napkins and table setting accessories. Until I reach this dream world, I still love to host dinner parties in my perfectly lovely little kitchen. Next week I am hosting my sister in law's birthday dinner and just as important as the menu is having a beautiful table. 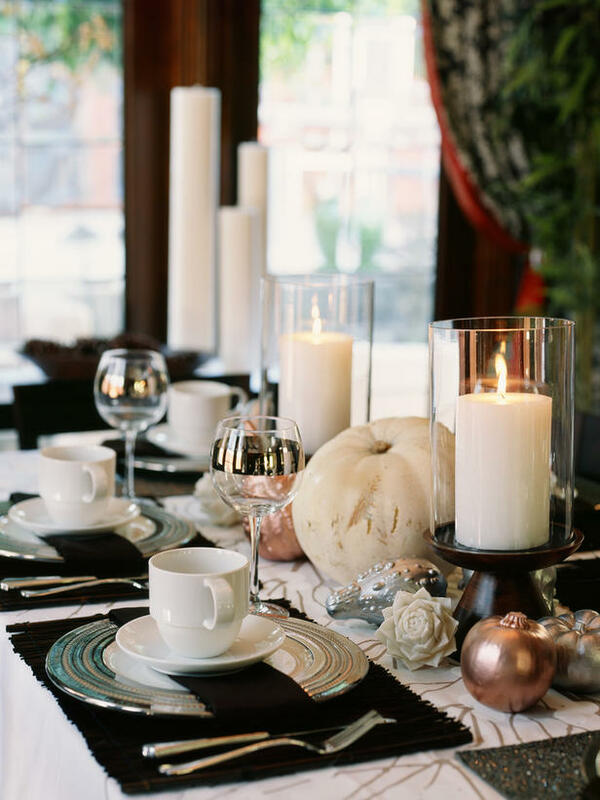 I have scoured the web and found these wonderful fall tables for inspiration! 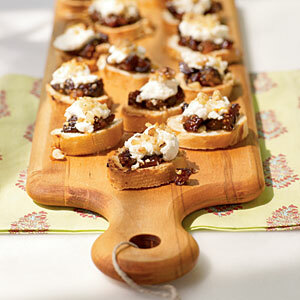 I love the rustic, simple looks of these images! 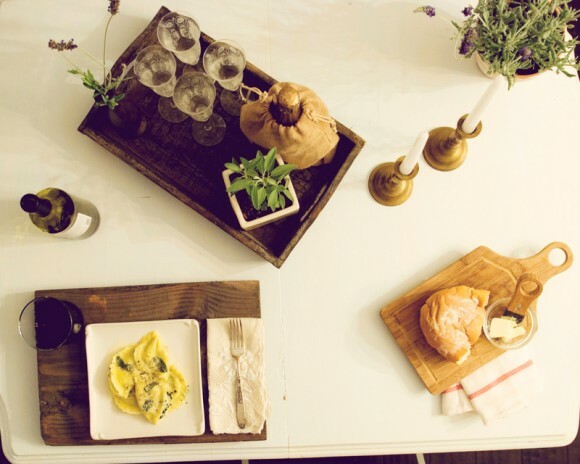 The use of cutting boards as serving trays is beautiful. 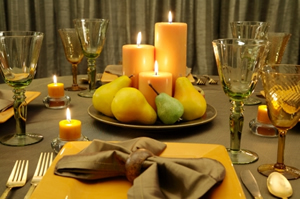 This next table is glamorous with the white pumpkins and candles. I also love the metallic elements! 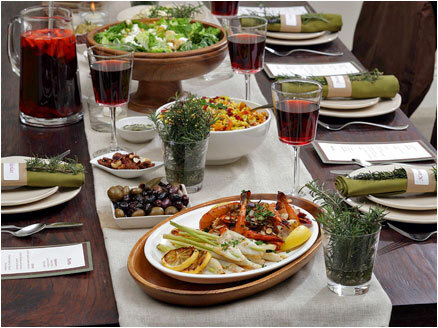 This table is perfect for the fall with warm colors and tinted glassware. I absolutely adore this simple centerpiece! 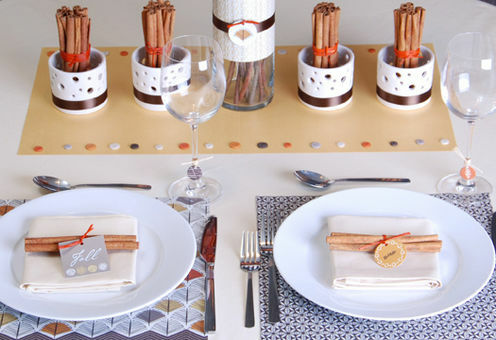 This next table is very simple with an elegant table runner and pretty napkin settings. Having a table runner is a great way to serve family style dishes. 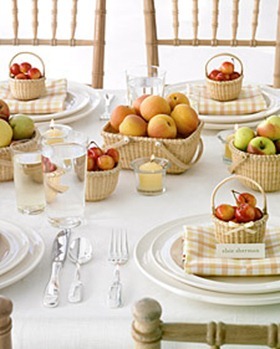 This next table gives you a way to use all of your leftover apples! And I LOVE the mini apple baskets on each place setting! 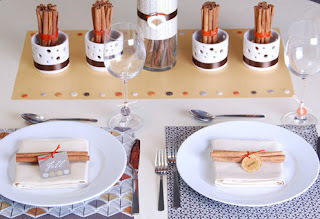 This table uses scrapbook paper as placemats and cinammon sticks as the decor! This would be perfect for Christmas as well! Finally, I love the wooden plank table runner on this table. 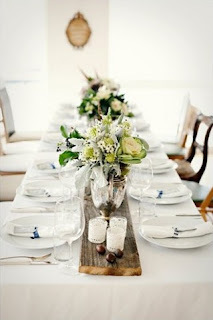 This is such a statement piece for the table, you really don't need any other decor except simple flowers! Well, it's off to the real world for me... but my mind is on beautiful tables and huge kitchens! that wood runner is so cool! 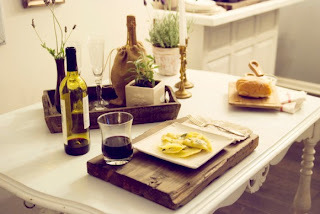 Love the cutting boards as serving trays idea. Very interesting. I love the last one. So fresh and pretty, yet still fall like!